My musings on life, Judaism, and just about anything else I feel like posting. 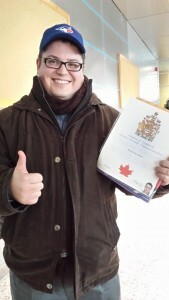 It’s official: after quite some time I finally became a dual United States/Canadian citizen. I moved to Canada in 2007 (married a Canadian girl and decided to take the plunge) and didn’t look back. The process was actually a bit lengthier than I thought. First, one needed to live in Canada for 3 out of 4 years (now they’ve changed it: it’s 4 out of 6), pay $200 for an application fee (now it’s $400), pass an exam and interview exam and interview with an immigration officer. The application was interesting in that you really needed to supply everything. It took a long while to get everything in order, from school records to ID photos to entries/exits, among other things. In the middle of the process was what was called a “questionnaire,” which essentially amounted to an application on steroids. The purpose of that “questionnaire” was to trip you up in causing you to answer different information than the application which could/would delay the process. I soon would find out that no one was immune.